The site, located in the West Midlands, north west of Walsall near Brownhills, is a former engineering works, which occupies an area of circa 0.5 hectare. 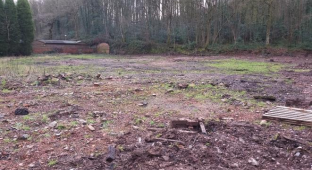 The site had been purchased by our client who was looking to develop the site for residential purposes. GIP Ltd had undertaken a site investigation of the site and identified hydrocarbon contamination (TPH and PAH) in the soils around the foundations of one of the former buildings that occupied the site. In addition hydrocarbon contamination was identified in the groundwater beneath the site. GIP reported ground conditions as made ground overlying sands & gravels over bedrock. The nearest watercourse was an unlabelled stream that flows through the site. A pond is located 50 m to the north east of the site. The site is situated upon a ‘Principal Aquifer’ as classified by the Environment Agency. The proposed remediation strategy was developed by Envirotreat from the initial outline remediation scheme proposed by GIP. The overall remediation strategy was designed to protect both human health and controlled water receptors. Capping layer – ‘Clean’ growing media should be imported and placed to a thickness of 300 mm in private gardens and to a thickness of 300 mm in any gardens / landscaped areas. Remediation of soils with obvious visual or olfactory evidence of hydrocarbon contamination in the vicinity of WS4. Gas protection measures comprising vented floor and provision of suitable gas membrane. Groundwater protection would be achieved through source removal (treatment).